News / Development / Box Hill to become Melbourne’s second CBD? Recognised as the gateway to the eastern suburbs, Box Hill has come a long way from its initial suburban identity. With a number of major urban redevelopment projects underway and many more set to define its skyline, Box Hill has become the fastest growing city centre outside of the Melbourne CBD and is now offering a genuine alternative to the Melbourne CBD for investment, employment, entertainment and a place to stay. It is somewhat the perfect storm that has been created that makes Box Hill an attractive proposition for a range of key industry players. The town centre is well served in terms of infrastructure. Box hill benefits from a well-located and established activity centre and shopping centre (Box Hill Central) with a diverse range of retail, commercial, food and beverage and entertainment offerings. The town centre is a major public transport hub, well supported by rail, tram and bus routes with both the Belgrave and Lilydale railway lines converging deep below the shopping centre, with a major tram route located along Whitehorse Road and a regional bus interchange located above the shopping centre. In terms of employment generation Box Hill also boasts the highest office floor area outside the Melbourne CBD and has been a long time home for some major health (Box Hill Hospital and Epworth Hospital) and education facilities (Box Hill Institute and Box Hill TAFE). Unlocking the potential in Box Hill has been the strategic work that has been carried out by Whitehorse City Council with support given to this vision by State Government for decentralisation. The Box Hill Transit City Activity Centre Structure Plan was introduced in 2006. The structure plan provides a framework for city development and identifies areas for growth with an emphasis on contribution to employment generation, housing supply and the 24 hour city. Of note is Precinct F where there are no height limits and higher rise development is encouraged. This area otherwise known as the development ‘’go zone’’ in Box Hill. Momentum has been gathering since the adoption of the structure plan though it is only been over the last few years that the development industry has sat up, taken notice and tapped into Box Hill’s true potential. Investment in Box Hill has skyrocketed in the last few years with much of this coming from Asian investors, and more specifically from China. It is worth noting that a significant proportion of the Box Hill population comes from Chinese descent and Box Hill host one of the biggest Chinese New Year’s parties in the country. There has still been a great deal of interest and investment from local investors too.The potential for uplift in value in properties has been a huge drawcard with single dwelling lots being converted into high rise multi dwelling mixed use developments. The sheer scale of potential development, encouraged in the Box Hill MAC, makes it an attractive prospect. Another key factor is that property values have grown considerably more in Box Hill than in equivalent suburbs in Melbourne. Property values have increased by a whopping 927% in Box Hill over the last 20 years. The adoption of the Box Hill Transit City Activity Centre Structure Plan all of 10 years ago has been a key catalyst for this. What has set Box Hill apart from other satellite centres such as Dandenong, Ringwood and Footscray is that the investment to date has largely been pouring in from the private sector. Whereas other centres have relied on State Government funding to a degree to kick start investment interest. Box Hill is now experiencing a building boom with a series of major projects underway or complete. And with up to 40 major developments with planning approval yet to commence construction and many more currently in the pipeline, at the planning and pre-planning application stage, we will soon be seeing considerably more tower cranes in the Box Hill skyline over the next couple of years. There will be an unprecedented growth in population and jobs as result of these projects. This though is only the tip of the iceberg with many more redevelopment opportunities still yet to be realised in Box Hill. Some recent key landmark developments in Box Hill of note are: the Box Hill Hospital redevelopment (completed), the new ATO at 20 storeys with 20,000sqm of leasable floor area (completed and occupied), the Whitehorse Towers at 36 and 26 storeys, which includes 511 apartments and an Art Series Hotel (currently under construction), SkyOne at 36 storeys, which includes 450 apartments and a food and beverage entertainment hub at street level, and the Spotlight development comprising three towers at 37, 30 and 17 storeys with a hotel a 450 apartments (recently approved). Other key major development projects currently being considered by Whitehorse Council include mixed use and apartment developments at: 820 Whitehorse Road at 30 storeys, 9-11 Prospect Street at 26 storeys and 5-9 Wellington Road at 16 storeys. The keen interest from prospective buyers is also worthy of note. 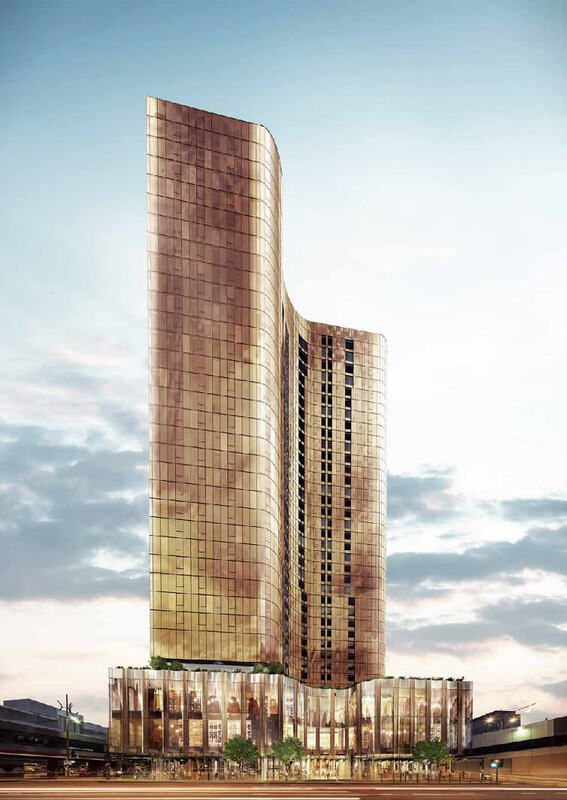 The Whitehorse Towers development (Asia Pacific) is one example where development interest has been vindicated. It is understood that most of the 511 apartments sold off the plan within 6 weeks. Apartments have also flown off the plan at Sky One (Golden Age) which will be commencing construction any day now. Success with rapid conversion with these projects has built more confidence in investors and developers and the like. Mix of uses and new uses. Clear strategy and guidelines as to where growth will / will not be supported. Rare political appetite supporting growth (unparalleled in Melbourne’s east). Opportunity for growth in spite of new height restrictions in the Melbourne CBD and indecision over Melbourne’s major urban renewal projects. Box Hill is well and truly booming and it has all the right ingredients for this to continue for some time. Whether you are coming to invest, work, live or play Box Hill is fast becoming the place to be. Paul McAleer is a former Planning Manager at the City of Whitehorse where a key focus was guiding major development projects in the Box Hill MAC. Paul has just recently joined Meinhardt as Associate Director – Planning.